DEBORAH CROMBIE: What a treat it is for me today to have my friend--and one of my favorite writers--Ellen Crosby as our guest. I'm so excited about her new book, THE VINEYARD VICTIMS, that I have it pre-ordered and will be waiting eagerly for it to appear on my doorstep next Tuesday morning. And I love Ellen's topic. I've called this thing that happens to writers synchronicity, but I think I like Ellen's term better. Katherine Neville, a good friend and international best-selling author, once told me that when she writes her books, magic happens. A book will fall off a library shelf open to a page containing the exact information she was searching for. A stranger turns up in her life with the precise answer to a research question just when she needed it. At first I thought this was simply Katherine, whose newsletters arrive on the summer solstice or the autumn equinox or Twelfth Night, because she is so tuned in to the karma of everything around her—until it started happening to me. Initially I thought it was a fluke, or maybe merely my imagination, but my husband began commenting on the uncanny coincidences that kept occurring: I’d start writing a book and, presto, the subject I was researching would turn up prominently in the newspaper or in an NPR story. Or I’d meet that stranger who had answers to my research questions. The Vineyard Victims, the 8th book in my Virginia wine country mystery series, was no different—though with a bit of a twist. Some of my synchronicity—or just plain good luck—happened while I was writing, but for the first time it showed up when the book was done, as well. In my story, Jamie Vaughn, a wealthy presidential candidate who owns a vineyard in Virginia, drives his gold SUV into a stone pillar at the entrance to Montgomery Estate Vineyard and dies in a fiery crash. Though friends and family believe it was an accident on a rain-slicked country road, Lucie Montgomery is convinced what happened was deliberate. Jamie had recently lost the presidential election by a close vote—yes, he also won the popular vote but lost in the Electoral College like you-know-who—and there were rumors of massive campaign debts. His last words to Lucie, who he’d nearly run off the road moments before the crash, were to find someone named Rick and ask for his forgiveness. Determined to carry out Jamie’s final wish, Lucie’s investigation leads her to Charlottesville and an elite, brainy group of friends at the University of Virginia who had kept some very old and dark secrets for more than twenty years. When I first came up with the idea for The Vineyard Victims, Donald Trump hadn’t even decided to run for president. Trump is not the only celebrity to own a vineyard in the Old Dominion—there are a bunch of ’em—but when he began campaigning, all of a sudden the media was full of stories that were a gold mine of research information. What intrigued me most about writing this book was exploring how someone as famous and instantly recognizable as, say, a presidential candidate, could keep a terrible, life-altering secret that nobody knew about or suspected—and get away with it. And what worried me as well was whether readers would believe it could really happen. Last weekend my husband and I flew to Boston to attend a memorial service for a dear friend who passed away in Geneva last July. Catherine was the very first person to read my manuscripts years before I was published; we met in Switzerland thirty years ago. Later I moved to London where she often came to visit and her comments and critiques continued, usually in my kitchen over a cup of tea. When our family finally returned to America, Catherine and I spoke over Skype. And when The Merlot Murders was published in the US, she left the first review on Amazon: thoughtful, honest, and constructive as always. For the last few years her fight against breast cancer—keeping the beast at bay, as she called it—meant she needed to focus her energy on more important things. After her service on Saturday morning, her husband arranged a luncheon at a picture-postcard perfect inn overlooking the ocean in the town where they own a summer home. A group of us had been chatting on the terrace watching her grandchildren play in the autumn sunshine with the fluffy white dog that had been her therapy dog. Out of the blue the conversation turned to the topic of the secret lives of famous people. I have no idea who brought it up—it wasn’t me. Honest. Charles Kuralt? The famous and instantly recognizable host for a quarter of a century of CBS’s “On the Road”? The man who appeared on national television each week with a voice you’d know anywhere? Everyone’s favorite uncle, who told heartwarming, nostalgic stories about a kinder, gentler America and made us feel good about our country? He duped his wife and daughters until the day he died and never ’fessed up? Neither did I. But I did know who was responsible for the subject coming up precisely when it did. DEBS: Ellen what a spine-tingling story. Coincidence. Or no? I am absolutely convinced that magical writing happens. Reds and readers, what about you? For many years Ellen worked as a freelance journalist in the US and while living overseas in London, Moscow, and Geneva, Switzerland before turning to writing fiction full time. 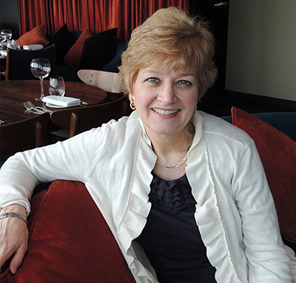 Her last job as a stringer was as a regional feature writer for The Washington Post, covering many of the places where her wine country mysteries are set. Here's more about THE VINEYARD VICTIMS: When Jamison Vaughn—billionaire real estate mogul, Virginia vineyard owner, and unsuccessful U.S. presidential candidate—drives his gold SUV into a stone pillar at the entrance to Montgomery Estate Vineyard, Lucie Montgomery is certain the crash was deliberate. But everyone else in Atoka, Virginia is equally sure that Jamie must have lost control of his car on a rain-slicked country road. In spite of being saddled with massive campaign debts from the recent election, Jamie is seemingly the man with the perfect life. What possible reason could he have for committing suicide . . . or was it murder? Congratulations on your newest book, Ellen. “The Vineyard Victims” sounds like a timely, exciting adventure and I’m looking forward to reading it. Many things happen in our everyday lives that defy explanation. I like the idea of considering those uncanny, helpful coincidences in your writing life as being magical. It’s a wonderful way to look at the happenstance . . . . Thanks, Joan! It's sort of ironic (and unplanned!) that my book comes out on Election Day--we have a fierce governor's race in VA that is attracting national attention as a litmus test for 2018. I will be glad when the bloodletting stops on Wednesday! Hope you enjoy the new one and thanks for your comments! Magical writing. What a perfect description. A conspiracy of the universe to bring the things we need to our attention. There's great comfort in the thought! Sounds like a wonderful read, Ellen. Thanks, Kait! I think we all could use a little magic these days. Hope you enjoy the book! I love the term, Ellen. And...Charles Kuralt? I had no idea. For me magical writing is also when my fingers type something that happens in my story - and I have no idea why it happened. But it clearly did, so now I have to keep typing to see what happens next! Oh, Edith, I do that, too! After taking Robert McKee's Story Structure class in London years ago--which is essentially about writing screenplays--I started listing all my scenes on a spreadsheet to keep track of the timeline and the plot. So I'm definitely a planner. But if the day's words deviate from what I thought I would write, the outline gets changed. You gotta go with the magic. The story sounds fun, Ellen, and I absolutely believe in magical writing. Sometimes I get the idea for a story, and the facts I need to create the foundation just seem to pop out of my computer and knit themselves together before my eyes. In one recent instance, iconic bluesman Robert Johnson gave me the formula I needed to keep hellhounds out of my garden through the lyrics of his song. I was awed, but not really surprised. A friend of mine would say that we put so much energy into what we're thinking and writing about that we manifest it into reality. If she's right, that's probably a good reason not to write about psychopaths. And yes, I'd heard about Charles Kuralt, although I'd forgotten until you reminded me. I guess that's why he spent so many years on the road. Gigi, I love your story about song lyrics giving you what you needed for your plot. So wonderful! And it's kind of scary to think about what your friend said about manifesting our writing into reality. Someone once told me that you don't have to be a murderer to write about murder--but we've all felt rage, anger, despair, and the dark emotions involved in those crimes. So what you need to do is evoke those feelings . . . and maybe talk to an expert who can fill in the missing stuff! Still, I think writing is better than therapy, don't you? Welcome Ellen--what a wonderful essay! And it is amazing about the secrets of the rich and famous. I've always wondered how politicians think no one will find out when they do something egregious (think Anthony Weiner on Twitter! )...maybe it was easier back in the old days before social media? Roberta, I know what you mean about wondering how the rich and famous seem to believe they're walking around with a Harry Potter invisibility cloak on so they can get away with anything. I think it takes a massive ego and a feeling of entitlement (hello, Donald Trump)--which is why it's so satisfying to be able to right those wrongs (or write those wrongs) in our books, don't you think? Hi Ellen! That sort of story makes the ones that we see in novels feel much more plausible. Best wishes with the new one--I'm still hoping to win one at Goodreads! Jim, telling you a secret: there will be another giveaway when the book comes out, plus ANOTHER one on Criminal Element. Your odds should improve!! Plus you have more time to read anyway, now that you are retired! For instance! In my new book, there's a character who goes to Harvard Law School. I do research of course, and Jonathan went there, but he's not a 35 year old woman in 2019. SO I said to J--do we know anyone who goes to the Law School low? Preferably a woman? And he said--well, sure. You mean like the student who just started working for me this semester? Yes, yes, indeed. Cannot wait to read your book, Ellen! Hank, your story is great! The universe DOES provide when the time is right, so true. When my husband was News Director at the Voice of America years ago, he used to travel to UNC-Chapel Hill every year where he gave a talk at the J-School, plus interviewed students for the Charles Kuralt Fellowship: a one-year internship working in the newsroom in Washington. He always commented about what a bright bunch of students they all were. Of course, the secret life stuff never came up! Looking forward to your new one!! I love the term "magical writing." That moment when I know what I planned to write is less than spectacular, I have no idea how to fix it, and suddenly a solution appears. Magical. I had no idea about Charles Kuralt. Oh Ellen. What a great story! And yes,I also find that magic happens all the time. When I was researching The Tuscan Child I needed info on WWII planes. We went to an old airfield in England and THE expert on the plane I was writing about just happened to be there! Rhys, that is so amazing! I remember one year when I needed to know something about converting a pesticide into anthrax and a microbiologist from UVA showed up at one of my signings. He offered to help me, but it took a long time for him to reply to my e-mail. Later he admitted he had been writing a colleague to discuss my question . . . and suddenly they realized they could possibly end up on some terrorist watch list if someone ran across their conversations! Triss, when I was growing up I used to wish I could know the future. Now the present seems so scary that I am glad I don't know what's around the corner!! But I do think it's very cool that you write about something and voila, reality imitates fiction. There must be magic there! Ellen, congratulations on your book's release. I am really looking forward to reading it - so timely! And as for your story, it gave me the shivers in a good way. Magic does happen - every single book! I've always thought it was just because of a heightened awareness during the creative process, but maybe there's a bit more to it...hmm. Jenn, thanks for this. I had no idea when I started writing it that Donald Trump would run for president. And even less of an idea that he would win! Hi Ellen! Thanks for being here today. I've had the magical writing thing happen to me in so many books, and what I've discovered (I think) is that you have to be open to the synchronicity. You have be interested in something, and so you become aware of any mention, and you talk to people about it, and that creates more connections. I've actually thought about doing a blog post about this very phenomenon, and you brought it up. See what I mean? By the way, I highly recommend reading Ellen's full bio on her web page, www.ellencrosby.com, and also her piece about how she wrote her first novel. Great stories there! Thanks for your hospitality, sweetie! Someone that famous getting away with a secret like that for years? Wow! What a wonderful "coincidence" for you right now to hear that story. Thanks for this, Mark . . . I am always amazed by what people believe they can get away with. And every time I worry no one will believe something I made up, usually I end up hearing about a real story that is even more outrageous! Whoa! No wonder Kurault was "on the road" so much! That's pretty damned bold, by the way, to be in the public eye for so long, and to keep up that much pretense. It's amazing how often these "coincidences" happen. Thinking about something, and looking up to see the exact phrase, person, or thing on a billboard, or hearing the very phrase or name on the radio or TV. Synchronicity is just the word, Debs. Magical writing is another crazy phenomenon. The best writing I've ever done was when I got into that zone, where the unconscious brain takes over and does the work. Getting out of my own way and allowing it is the hard part, isn't it? Karen, that is a great description--that we need to get out of our own way and allow the writing to happen. Have not really thought about it that way! And, yes, it was unbelievably bold and brazen and a bunch of other things. What I wonder is how his wife could never have suspected a thing for so many years?? Welcome to Jungle Reds, Ellen! I remember seeing you at Bouchercon this year. I agree that magic happens when you write. When I read a novel, magic happens. I love the term "magical writing". For some reason, I thought of Joan Didion's book "Magical Thinking". Diana, "The Year of Magical Thinking" has been on my TBR list for a while. (She's such a wonderful writer.) Now you've got me thinking that it needs to move to the top of the pile. Nice to see you in Toronto as well! Oh, Charles Kuralt! How could you be such a creep?! Welcome, Ellen! I love hearing about your magical writing. How much of it do you think was always there, but you weren't looking for the signs so you didn't see it? Ingrid, I agree with you. How could Charles Kuralt's "real" family not know about the second family out west? Or at least suspect something! I wondered the same thing when Robert Hanssen was arrested for spying some years ago and his family had no clue what he did. It was especially creepy because one of the places he used to get and receive messages was a park down the street from my sons' high school and he went to my parents' church. Hey, everyone! Debs, thanks so much for inviting me back to JRW for "The Vineyard Victims." I love all the comments and the magic that everyone is writing about, especially Rhys finding the perfect WWII airplane expert and Hank discovering that Jonathan's law student intern was exactly who she was looking for. And, in a parallel universe, Debs and I wrote almost the same scenes for our books (different characters, of course!) without knowing about each other. As I told Debs, I think a lot of this happens because as writers we pay so much attention to what's going on around us--I bet everyone carries a notebook with them at all times (including one on the bedside table) to jot down something we see or hear or think about, right? I loved Katherine Neville's description of synchronicity, but she also said, more prosaically, "When you're a hammer, everything looks like a nail." So maybe we make some of our own magic, too. Either way, as my agent always says, I'll take it! So happy to see you here, Ellen! I've been a fan since Merlot Mysteries! Magical writing? If only... Though I do find inspiration in unexpected places, and often at the end of what I thought was a blind alley. Hallie, we have some pretty amazing memories together, my favorite being the 100-bottles-of-wine dinner at the Broward County library fundraiser in Florida! And leaving our shoes in a heap on the pier while we boarded that incredible yacht for a group photo in our sock/stocking feet! I remember when Charles Kuralt died and all that came out about his second family. Yeesh. It sounds like serendipity comes into play quite a lot for you writers. The new book sounds great Ellen! Can't wait to read it. Ellen, are you touring? If so, tell us where you'll be! Magical writing is a wonderful term for what you describe, Ellen. It's as if what you're writing is meant to be, and the universe is making sure you know that. I often feel a similar connection to reading, and it happens a lot here at the Jungle Reds blog. I've been looking at an author or a book, and, voila, I open up the Reds blog, and that author or book is featured here. And, sometimes it's a subject matter that is spot on for me at the time, too. Now, there are other places I get this connection, but this blog is the single most magical connection I have ever had. Little wonder that it is such an important part of each day for me. 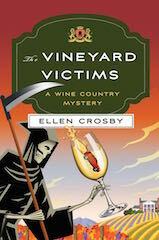 I have to tell you, Ellen, how much I love the covers of the Wine Country Mysteries. They are on my radar and on my TBR list. Thanks for visiting here today and sharing such a great post. Kathy, that is the nicest thing to say!! I do think we have magical synchronicity on Jungle Red. And I love Ellen's covers, too! Thanks for the comments on my book covers, Kathy! The paperbacks of the first 6 books from Pocket Books were designed by Wendell Minor, who has designed some iconic book covers, including "To Kill A Mockingbird" and "Catch 22." Look up his website and you can find him on Facebook as well. He also published a book, which I own, called "Art for the Written Word." I'm also in love with my Scribner hardcover jackets and my new Minotaur covers. I think one of my favorite parts of the book production process is the first time my editor sends me the new book jacket! And I agree with you about the magic of Jungle Reds! Debs, yes, indeedy, I will be touring! "The Vineyard Victims" comes out on Tuesday, which is Election Day and a Big Deal here in Virginia where we have a governor's race that is supposedly a litmus test for 2018, so I'm postponing the launch to Wednesday, November 8 at One More Page Bookstore in Arlington, VA. If you're coming, there will be cake and wine. :) I'll be at a bunch of places in the Metro DC area through mid-December (all listed on my website), plus at The Poisoned Pen in Scottsdale, AZ a week from tomorrow (November 11), Mechanicsburg Mystery Bookshop in Mechanicsburg, PA on December 9, and Mystery Lovers Bookshop in Oakmont, PA with Con Lehane on December 16. Please come see me somewhere!! Call it magical or synchronicity or whatever but for years I thought everyone's life worked that way. I'd talk to people and "intuit" things about them, I'd be working on a hard piece of writing then walk away - and usually straight into the answer I'd been searching for. I really prefer to think of it as magic and now I know several other writers who have the gift also.